without annoying the neighbors (according to rules for Yosemite National Park, and many other jurisdictions). Smoking campfires cause a lot of pollution and can get your next door campsite neighbors (or even neighbors many yards away) coughing. 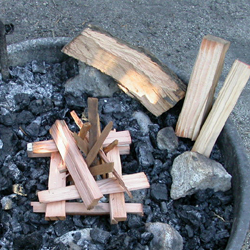 It is easy to build a campfire that doesn’t smoke much. Green sticks off the ground won’t burn well or at all (and it’s illegal to collect firewood, pinecones or even pine needles in Yosemite Valley, for example). If you choose to use wood you find where you are camping, use only dead and down wood. Don’t break branches from a tree even if it looks dead. Almost everywhere you might camp will give you a copy of the rules when you arrive. They can be quite different than the last place you camped. In some places it is actually against the law to bring in wood from other locations. Sometimes there are more restrictions than the last time you camped at the same place because of dry conditions. Small sections of not too-tightly-crumpled newspaper start a fire much more easily than pine needles and smoke a lot less. This fire will not light. 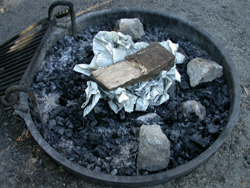 The newspaper crumpled under the log will light and burn away without doing hardly anything to the big log. This fire will not stay lit. 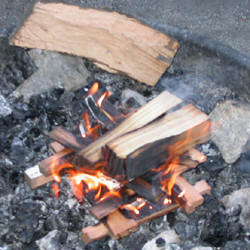 The newspaper crumpled under the logs will light the small pieces of wood (sometimes referred to as tinder) but when they burn away the log will not have caught fire. It needs some in between sized pieces. This fire is set up to succeed. It has a little newspaper, (not crumpled too tightly so it will get enough air), some small tinder and some moderate kindling sized pieces. The moderate sized pieces could have been in an A shape instead of a square. 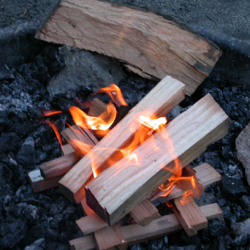 All the pieces of wood are close enough to each other to reflect heat from each other and keep burning, but not so close they won’t get enough air. Here we see the fire as it is lit and a few moments after. By having it properly set up we don’t have to do anything to make it stay lit. Bring good wood matches, not paper book matches. 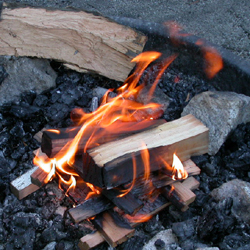 Strike-anywhere-type matches can be started against a rock. The striking surface on boxes of other kinds of wood matches sometimes wears out or gets wet. We also bring a lighter to light matches in damp weather. Once the first setup gets going, more wood can be added. 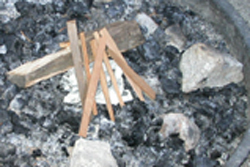 As the wood burns, the pieces settle down and shift, in this case putting two pieces too close together and starting the fire smoking. By separating the pieces slightly they now get more air and burn better, with less smoke. 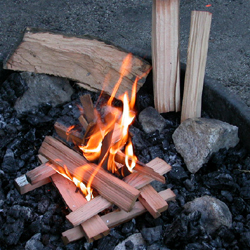 More wood is added as the first pieces burn. Add them at an angle with lots of room for air circulation, but still close enough to the other pieces that they will reflect heat off each other and burn. If we wanted a campfire to last for awhile, we could add bigger pieces now. 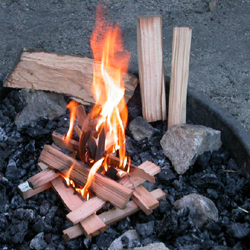 If we add bigger pieces for a longer fire they need company of other big pieces, too. Together a few big pieces might stay going, or they may need a few pieces of kinding added to help them burn as the evening goes along. Do not leave fires unattended at any time. 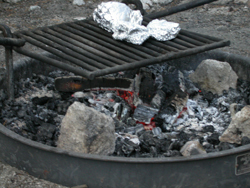 Only build campfires in the designated grates or rings provided at your campsite. Tie back your long hair before you lean over the fire. Keep a few gallons of water ready near the firepit to put it out. Don’t burn trash or garbage, including apple cores and orange peels. Don’t try to burn tin foil, it just turns into ugly specks in the firepit. Don’t try to burn tea bags, excess food, coffee grounds, etc. Burning organic matter completely requires a very hot fire, hotter than most campfires. Don’t make a huge fire that can get out of control. Most experienced campers build small campfires that can actually keep people warmer than huge blazes you have to stand away from. Don’t try to use lighter fluid, lantern fuel or other explosives to start the fire. 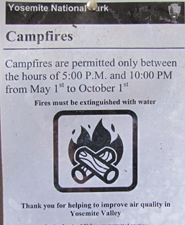 Some places have regulations about what months of the year or time of day fires are allowed. 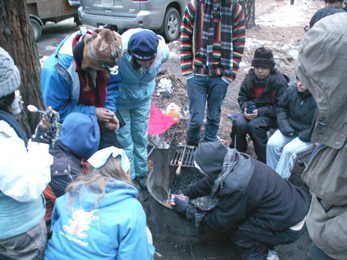 A campfire is a fun part of recreation, but not a toy for kids. Little ones should not poke around in the fire as they can too easily hurt themselves. When roasting marshmallows, if one starts to burn and you don’t want that flavor, either give it to someone who does or let it finish burning in the fire. Do not try to put out the flames by waving it in the air as you can cause flying bits of burning sugar to land on others. A long wire such as an untwisted uncoated coathanger is safer for roasting food than a short twig. Again, newspaper, lightly crumpled, is a good starter for small twigs/tinder for a campfire. Pine needles mostly smolder and smoke. But, if you just pour a bunch of water on a blazing campfire, you’ll create a cloud of steamy smoke with a bunch of ash particles that may coat others nearby in your group or bother people two campsites away. Instead, plan to take the time to put the fire out properly. Don’t put on extra wood really near bedtime. When it’s time to put it out, push the logs or remaining chunks of glowing charcoal apart, let them die down a little, and then finally sprinkle water on. If it makes huge clouds of steamy smoke, you need to let it die down before you put on more water. To be sure it’s out completely, move any lanterns away from the area, turn off any flashlights (electric torches), stir the campfire debris around, then pour more water on any glowing coal bits. Don’t let anybody dissuade you because they say they won’t be able to build a fire the next day (they’re wrong). 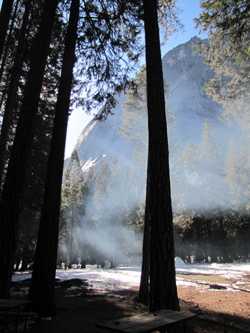 If you visit a place like Yosemite valley often enough, you will notice the smog and be glad you didn’t contribute to it. David Aland, his wife, and two teenage daughters were staying at the concession-owned Colter Bay Tent Cabins on the night of July 15th. 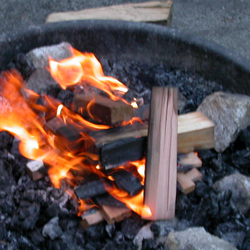 Although area temperatures had been unseasonably high, Aland decided to light a fire in the tent’s potbellied stove before the family went to bed at 11:30 p.m. After several unsuccessful attempts to light the fire with wood and paper, Aland removed a lid on the top of the stove and poured Coleman fuel into the opening. The smoldering fire immediately burst into flames and quickly spread to the tent walls and ceiling. The family evacuated the burning structure and the North District Fire Brigade was summoned. Nearby campers assisted by dousing the fire with extinguishers; fire brigade members put out the fire and conducted the investigation. Fortunately, Aland suffered only minor injuries, but the family clothing, camping gear and bicycles were destroyed. The tent-cabin is constructed of a combination of log and canvas walls with a canvas roof. The canvas was treated with a flame resistant coating that ensured the complete structure did not ignite and burn, but significant damage was incurred.